Home Staging - Our mission is to create gorgeous, livable spaces that buyers fall in love with, so the home sells fast and for the best possible price! Redesign - The mission of our redesign service is to have a thorough understanding of our clients, their home and their day-to-day needs to create an organized, stylish, reflective space that gives them peace, sanctuary and helps them to LOVE their home! Get your step-by-step staging guide today! 1st Stage Home Design is an HSR Certified Professional Home Staging and Interior Redesign organization serving the Jacksonville, Orange Park, Fernandina, St. Augustine SERVED. 1st Stage Home Design has completed the most comprehensive home staging and redesign certification courses in the country provided by the Home Staging Resource. 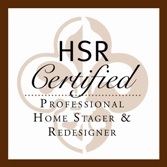 The HSR Certification program is accredited by the Real Estate Staging Association (RESA), who is the only third-party, governing association for the home staging industry. The Home Staging Resource is the first and one of the only accredited staging training courses available for the staging industry. At 1st Stage Home Design, we are expert in creating a vision in each home that buyers will fall in love with! Passionate and enthusiastic about design and staging, I know she will take great care of her clients and homes! Site contains some stock photos provided by the Home Staging Resource. All photos in portfolio are stager's work. Copyright © 2013. All Rights Reserved.